When your pet's mouth is in poor condition, she may develop serious problems such as halitosis, gingivitis, tartar buildup, resorptive lesions, tooth abscesses, and periodontal disease. These conditions cause a build-up of bad bacteria in the mouth, which can affect internal organs, such as the heart, liver, and kidneys. One of the ways we combat these bad bacteria is with a full dental cleaning. These cleanings resemble the care we receive from our human dentists and include full dental x-rays, scaling/polishing of the teeth, and teeth extractions as needed. Prior to the procedure, the dental technician will place an intravenous (IV) catheter. This catheter will be used to draw blood, to administer medications, and to administer propofol anesthetic. Because dental procedures require anesthesia, we always perform pre-operative blood work beforehand to determine that your pet is healthy enough on the inside to handle the anesthesia. This blood work will check for kidney and liver function among other health markers. Blood work is processed in-clinic, so we get results right away! If the values are all in the normal range, your pet is ready for the procedure. 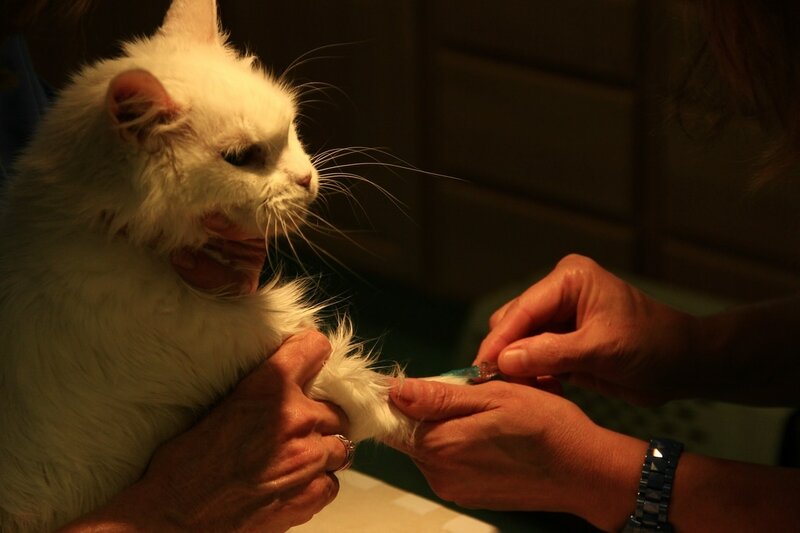 The technician injects propofol into the IV catheter to sedate your pet before inserting an endo-traecheal tube, which prevents fluid and bacteria from entering the lungs. The technician then maintains the patient with gas anesthesia throughout the remainder of the procedure. Heart beat and oxygen levels are monitored closely at all times. ​x-rays inform the veterinarian whether or not teeth need to be pulled or if more extensive, deep cleaning should be performed. The veterinarian analyzes the x-rays and determines if any extractions are needed. The technician finishes the procedure with a scale and polish. Scaling the teeth removes any plaque/tarter buildup. Polishing the teeth softens any ridges in the teeth, which can attract bacteria. 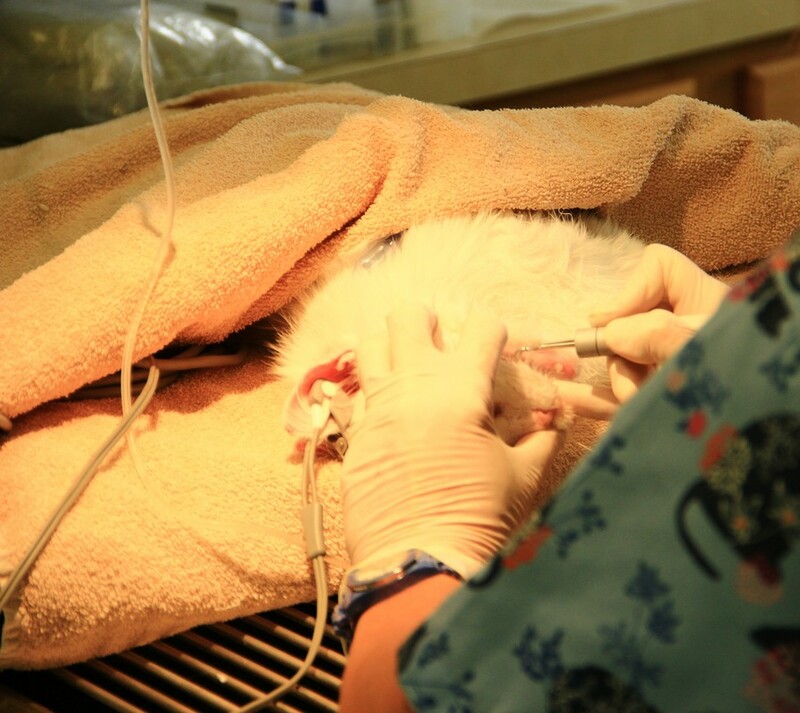 Once your pet is taken off anesthesia, the endo-traecheal tube is removed, and she is awake within a few minutes. Canned food is offered, and we recommend you continue with this canned food diet for at least five days. Pets are able to go home the same day. Routine cleanings do not require continued at-home medication, but pets with severe dental disease or extractions may require antibiotics and pain medication to be administered at home. To maintain your pet's new pearly smile and prevent future dental problems, we recommend at-home dental care such as Hill's Prescription Diet T/D and Oratene products, which you may purchase in-clinic or on our online store. As always, if you have any questions about pet dental health, please contact us!